I spent the first post noting that the Christian understanding of the sacredness of the Bible is quite different from some other faiths’ understanding of sacredness. For example, sacredness of the Quran within the Muslim community sees it often terms of physical sacredness. Within Christianity, sacredness is functional. That is, it is the message of God that is sacred not the physical medium upon which the message is imprinted. There are of course Christians that hold to a sort of a “Quranic” understanding of sacredness with regards to the Bible. For them, the Bible is something to be placed on the family altar, or carefully placed high in a bookshelf. Writing for them in the Bible would be a form of desecration except for a name in the front and perhaps genealogical information. But that is not a hugely common view especially among Protestants. For Christians, desecration occurs when the message of the Bible is ignored, misinterpreted, and misused. Frankly, that is far too common. HOWEVER, a concern does exist when it comes to the Bible as a symbol. Consider the following roles of the Bible as a symbol. 1. Christianity. In the Muslim understanding, Christians (along with Jews) are often interpreted as “People of the Book.” So the Bible is symbolically seen as connecting one with being a Christian. In Protestant (especially Evangelical and Fundamental) circles, the Bible is given such a high place (sola scriptora) that one’s identity as a Christian is seen in terms of one’s position with regard to the Bible rather than to the Church. A cross may be used as a symbol for Christianity. A fish (ichthus) may also symbolize Christianity. However, an image of a Bible is also nearly universally recognized as a symbol of Christianity. It is assumed by most that if one is a Christian, one has at least one copy of the Holy Bible. Many churches strongly recommend that their members bring Bibles with them to the church service, even if Bibles already exist in the pews. What are the implications of this? Since the symbol of the Bible as representing Christianity is recognized beyond Christian circles, how one treats the symbol can be seen as indicative of how one values what it represents. 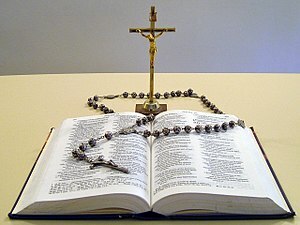 Therefore, although I reject a physical sacredness of the Bible (as understood by some other religions), from a symbolic standpoint, it is important to demonstrate a certain protective care of the Bible (physically) since it suggests to many (because of the symbolic role of the Bible) the value one places in one’s Christian faith. 2. Authority. As Wayne Oates noted in “The Bible in Pastoral Care” a common symbol of the Bible is one of authority. This understanding is not limited to message. The word of God may be “a lamp unto my feet and a light unto my path.” But the symbol extends to the physical as well. Many preachers are strongly encouraged to have a Bible with them in the pulpit. Is it necessary from a functional standpoint? No. If the preacher is doing a manuscript sermon, the Biblical text is PROBABLY already on paper. Or else the passage is on the screen. But reading from the Bible directly, or holding a Bible in one’s hand when speaking symbolically suggests that the person is speaking on behalf of God… that is, with authority. In pastoral care situations, carrying a Bible with one, implies that one is acting on behalf of God as a caregiver. Reading from the Bible is often seen as more authoritative by the listener than quoting from memory. Implications here are a little different. The Bible, as a symbol of authority, should be somewhat worn rather than pristine. Carrying a beautiful unused Bible reduces the symbolic authority, since it suggests that the pastor/preacher does not receive his authority from God’s Word. If God’s word is at hand but not showing evidence of use, then the authority of the religious leader is questioned. 3. Power. We know that the Bible is considered powerful in its message “sharper than any double-edged sword” and whose message “will not return void.” However, this is the symbol that to me is most open to abuse. The Bible can be used as a symbol of power to such an extent that it can become a talisman. Again, Wayne Oates notes concerns of misuse as a talisman where one is instructed to read a certain number of passages or put the Bible under one’s pillow at night to limit temptation. Or place on one’s body for “physical healing.” Also, there is the concern that the symbol of the Bible as power, is also used as a a form of ecclesiological control. Medieval Catholicism (especially in Spain) placed the Bible in a position where it could only be read, understood, and used by religious leaders. The symbolic power of the Bible became a form of control… much like limiting the understanding of navigation to a ship’s captain was used in centuries past to maintain control… preventing mutiny. To me, as I suggested above, the symbolic understanding of the Bible in terms of power is the most problematic. Power ultimately comes from God and is described to us in the message of the Word. The symbol of the Bible can become an amulet or talisman, supposedly warding off evil, used as a lucky charm, or as a method to achieve personal ends. The symbol can also be shifted from power to selfish control. I would recommend the shift of the Bible as a symbol of power to a symbol of hope. There are more ways the Bible can and does function symbolically. Symbolic roles simply can’t be ignored regardless of whether one agrees with that role. In a missions setting, one cannot ignore the complex web of symbolic understandings that are placed on the Bible. It is useful to correct misunderstandings… but one does not correct by ignoring.